Title: Moon Jumper. 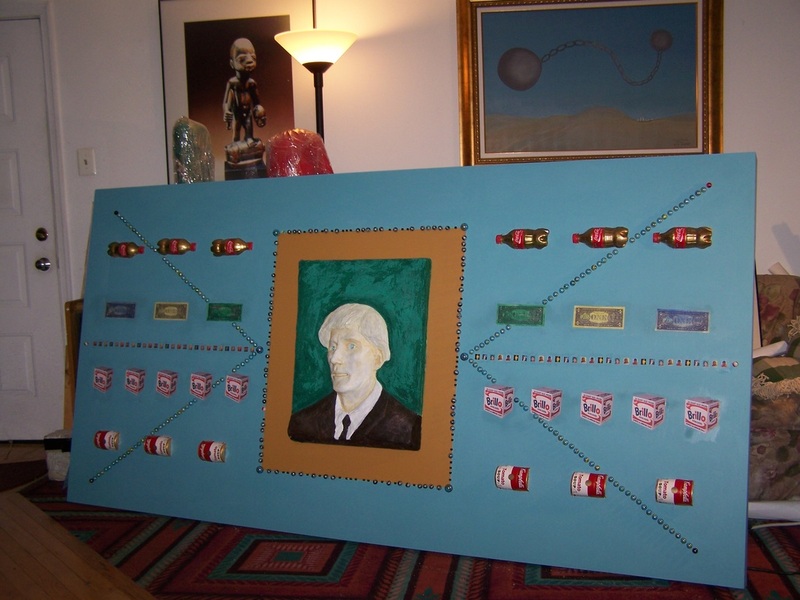 Medium: acrylic paint, stone, Blown Glass, Cast Glass, Marbles, Dominoes, Cut Bronze, Copper Wire, Glass Beads. Size: 48" x 48" x 13". 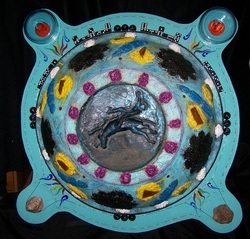 “Moon Jumper”, is from my Calabash series. Calabash is a Gourd that is used for utensils and food bowls in Africa and the West Indies; it is sometimes highly-decorated by well-known local artists. Size: 38” x 27”. Medium: Glass Mirror, Glass Beads, Transfers, Digital Photos, DVD, Camera Lenses, Gold gilding, Photos, Acrylic Paint. Amy Twenty-Seven. This exploration has a cryptic and mystical sensibility that isolates this Artist from her reflection. Captured in this canvas is a visual language and cultural idioms of our day. Through the lens of this interdisciplinary timeline, is a portrait that is focused on Amy Winehouse an English singer who died at age twenty-seven with a promising career ahead of her. Also captured here and known for their avant-garde cultural and musical explorations, juxtaposed in this portrait, is Jimmy Hendrix, d.1970 and Robert Johnson in d.1938; they also died at age twenty seven. Robert Johnson is said to be one of the founders of the Blues died of mysterious circumstances. Legend has it, he made a deal with the devil at the Crossroads to learn how to play the Blues. Jimmy Hendrix, famous for his innovations in Blues and Rock somehow died of a massive drug overdose. Is it by coincidence that in this Glass portrait of Amy Winehouse that all three died at age twenty seven? In this Gilded Mirror, we can see a reflection of ourselves and our generation living, dying and loving. But for one brief moment in time, Amy Winehouse is caught “in Camera”; she turned what could have been ordinary music and cultural sentiments of our day into the spiritual, infinite, and the divine conversations of today. In a constant battle between preservation and deterioration, the Dragon Fly and other insects represent rebirth and our final spiritual resting place. Short on time, the imbedded dual DVD’s apply showcase Amy’s message for our generation: standing pronounced, gone are the pigments of division. Significantly, “In Camera” captures a diverse and enriching reflection of the crossroads of our time.